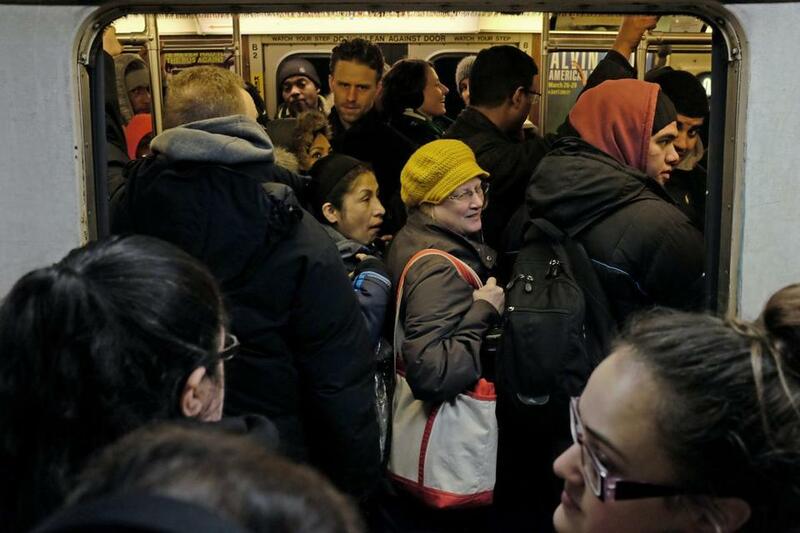 An Orange Line train had little room for more riders in 2015. On Tuesday, the business group A Better City will release a report showing the increasing strain that a growing and moving population will place on the roads, rails, and other critical infrastructure in Greater Boston. Another 80,000 cars and trucks will crowd the roads every work day by 2030, according to the group, a nearly 5 percent increase from 2010 levels. The already stressed MBTA subway system will have to accommodate another 14,000 commuters every day, while buses and trolleys will see a nearly 7 percent increase in ridership, Dimino’s organization predicts. And out at Logan Airport, which is already expanding to deal with a surge in passengers, traffic could increase by another 63 percent within 15 years. The underlying catalyst is a sustained increase in the region’s population, particularly in neighborhoods in and around Boston, as more younger workers choose to live in urban settings. The population in the larger metropolitan area will increase by about 10 percent between 2010 and 2030, to 4.5 million. But inside the Route 128 “inner core,” the population is projected to increase by 17.5 percent, while growing at a much slower rate in the outer suburbs. That growing population will need more electricity and natural gas and generate more waste, further taxing the region’s systems of pipelines, power lines, and garbage and recycling services. “There are many areas that will need some substantive attention if our infrastructure is going to keep pace with our economy,” Dimino said. James Rooney, chief executive at the Greater Boston Chamber of Commerce, said the rapidly changing demographics add urgency to ongoing concerns such as the cost and supply of new housing. The report, by researchers at Northeastern University’s Dukakis Center for Urban and Regional Policy, raises important questions, such as how to meet the projected demand for more mass transit or what land-use decisions should be made to avoid gridlock. But it stops short of making actual recommendations. Perhaps the biggest unanswered question: Who is going to pay for the improvements needed to keep up with the changing population? That challenge was underscored during recent discussions about a nearly $1 billion cost overrun on the expansion of the Green Line from Cambridge to Medford. Facing the threat of a cutback in the project by the MBTA, the cities of Somerville and Cambridge have agreed to together contribute $75 million, with some help from the developers behind the NorthPoint complex in Cambridge. Indeed state officials are considering whether to ask those commercial property owners whose land will have increased in value because of new transit service to help pay for that service. But David Begelfer, chief executive of real estate trade group NAIOP Massachusetts, said developers should not be singled out. He suggested that cities and towns, many also benefiting from the recent surge in local property values, should contribute as well — much like what Somerville and Cambridge agreed to do with the Green Line. Raising taxes for property owners could threaten a number of projects, he said, making them financially unfeasible. “One has to be very careful that you don’t literally kill the golden goose,” Begelfer said. Another option: thinking differently about transit. Dimino suggested deploying more rapid-transit bus lines, similar to the Silver Line, as a more affordable alternative to expanding subways or commuter rail. For Logan Airport, the report estimates the number of travelers will grow to 54 million in 2030, a 63 percent increase from 2015. Barry Bluestone, one of the report’s co-authors, said that growth could prompt policy makers to work more closely with the operators of airports in neighboring Rhode Island and New Hampshire. But Massachusetts Port Authority chief executive Thomas Glynn said those growth figures are probably overstated, in part because it’s unlikely that Logan will continue to add international flights at anywhere near the pace it has done in the last few years. Dimino said he expects his team will hold briefing sessions with city and state leaders and key legislators during the summer and fall to provide them with data as they grapple with the questions raised by his group’s report.